Long-time MossRehab and Einstein champions, Marc and Nancy Shrier. 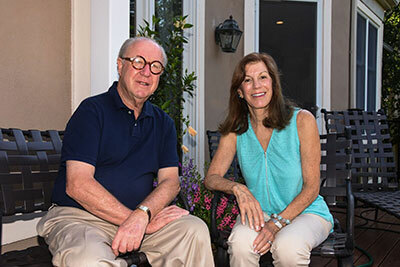 For Nancy and Marc Shrier the connection to MossRehab and Einstein is familial and it is strong. Nancy’s father, Larry Wachtel, was a member of the original Willowcrest Board of Directors. Her brother, Louis Rosenthal, served for many years on the Einstein Board of Directors and her stepmother, Hilda Wachtel, was a long-time member of the Friends of MossRehab. Nancy, herself, began her involvement as a candy striper at Willowcrest at age 16. Currently, as a member and former Chair of the MossRehab Advisory Board, Nancy has dedicated countless hours in support of programs benefitting both MossRehab and the network. Both Nancy and Marc’s children, Lee and Peter, were born at Einstein and they both most recently served as Co-Chairs of Einstein’s 150th Anniversary Committee. Marc and Nancy Shrier attended the most recent installment of the Shrier Family Topics in Rehabilitation Science Lecture Series with (far right) John Whyte, MD, PhD, founding Director of the Moss Rehabilitation Research Institute (MRRI) to hear guest speaker Steve Jax, PhD, Institute Scientist, MRRI. 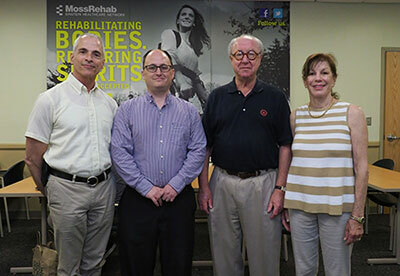 Marrying their desire to support the research efforts of MossRehab and their interest in ongoing education, the Shriers made a generous gift in support of a program which combines both. 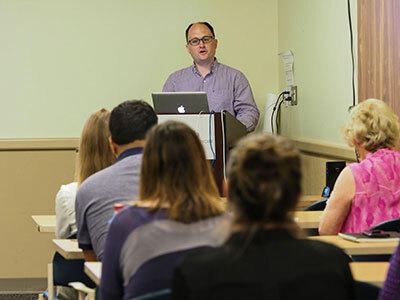 The Shrier Family Topics in Rehabilitation Science Lecture Series enables the MRRI to better support its staff by creating and funding opportunities to expand both internal and external research education. Additionally, it provides resources to support engaging guest lecturers from other leading research organizations, in addition to MossRehab clinicians. Working with John Whyte, MD, PhD, founding Director of the Moss Rehabilitation Research Institute (MRRI), the Shriers are supporting Einstein’s goal of providing the most advanced therapy and technology to help patients overcome physical disabilities and get back to the business of life. These lectures are presented by MRRI scientists as well as scientists from other leading research organizations to MossRehab clinicians including physicians, therapists, psychologists, nurses and social workers, allowing for the latest research to directly inform and impact patient care. In addition to the lecture series, MRRI scientists travel throughout the world participating in top research conferences, often as speakers. Steve Jax, PhD, discusses results of a clinical trial of treatment response for patients with neurological/cognitive impairment.